I have a theory that if you keep your intentions (or resolutions as is the case with each new year) to yourself, you have a better chance of achieving them. The more you talk about something—a goal, a resolution, a project, an intention—the more it scatters. It’s like you’re frittering away bits and pieces of your grand design each time you mention it. The more you talk about it, the less interesting it becomes. Your brain registers a premature sense of accomplishment. So—I’ve decided not to broadcast my list of 2012 resolutions. I’m keeping them to myself, thinking they have more power to blossom if I don’t talk about them (especially that 5 pounds I need to ditch and the mountain I want to climb). Out with the old—in with the new. Instead of a resolution list, I’m making a list (a glossary actually) of farm-fresh words to share over at The Balanced Platter, Amy (Simply Sugar and Dairy Free) and Maggie’s (She Let Them Eat Cake) new home for all things related to healthy and balanced living. During this month’s launch of TBP, you’ll find a steady stream of up-to-date information, helpful tips, brilliant ideas, and wholesome recipes instead of resolutions. We’re all in this together, let’s share our wisdom for a brighter and more balanced 2012. Biodynamic: A form of organic farming that emphasizes the relationship between the soil, plants, and animals as a self-sustaining system. Biodynamic farmers seek to maximize diversity in their farming practices by treating their farm as a unified organism. They avoid the use of artificial chemicals and practice crop rotation, composting, and plant and harvest according to seasonal and lunar rhythms. Cage-Free Eggs: There is no legal definition of cage-free. Often cage-free hens live in crowded conditions with no access to the outdoors. Seek out local farmers who practice human animal husbandry. Organic eggs from healthy, pastured chickens look and taste very different from the conventional version. Certified Naturally Grown: Certified Naturally Grown (CNG) products are certified by an independent nonprofit organization (not USDA) as having been produced in approximate accordance with national organic standards, a program involving fewer paperwork requirement and lower certification fees for farmers than the USDA’s National Organic Program. Community Garden: A community owned and/or operated plot of land that is divided up for individuals or families to grow food. Community Gardens provide an opportunity to grow low cost, nutritious food and can contribute to the local economy by allowing gardeners to sell their produce at Farmer’s Markets. Community Supported Agriculture (CSA): Consumers buy a share in a local farm or garden, usually paying before the beginning of the season—in return, they receive a weekly supply of fresh, local produce that is harvested throughout the growing season. By paying up-front the shareholder gives the farmer cash to start the season and also takes on some of the risks associated with farming (hail, drought, etc.). I’ve been a member of Grant Family Farms CSA here in Colorado for years and appreciate the opportunity to have locally grown, organic food, fresh from the farm. Check here to find a CSA in your area. Conventional: Refers to standard agricultural practices that are widespread in the industry. Can (but does not necessarily) include the use of pesticides, synthetic fertilizers, mono-cropping, antibiotics, hormones, and other chemical approaches. Conventional farming in the U.S. may also include the use of GMOs. Farmer’s Market: Refers to an open-air market where farmer’s sell their produce directly to consumers. Farmstead Cheese: Farmstead cheeses are made by the same people who farm the animals producing the milk. Farm-To-Table: Signifies that the food on the table came directly from a specific farm, or a meal prepared and served at the farm where the food was grown. The use of farm-to-table also emphasizes a direct relationship between a farm and a restaurant or store. Food Shed: The term food shed is similar to the concept of a watershed while watersheds ouline the amount and flow of water supplying a particular area, foodsheds outline the flow of food feeding a particular area. Your foodshed encompasses the farm, your table, and everything in between. Free-Range: USDA regulations apply only to poultry and indicate that the animal has been “allowed access to the outside.” The USDA regulations do not specify the quality or size of the “outside” or the duration of time an animal has “access to the outside.” Most farmers that you meet at the farmer’s market or through your CSA raise animals that are actually free to roam naturally, but if you want to be certain, you should visit the farm. GMO (Genetically Modified Organism): GMOs are plants and animals whose genetic make-up has been altered to exhibit traits that they would not normally have, like longer shelf-life, different color, or resistance to certain chemicals. In general, genes are taken (copied) from one organism that shows a desired trait and transferred into the genetic code of another organism. Genetic modification is currently allowed in conventional farming. Gleaning: To gather food left behind after the harvest. Sometimes farmers invite people to their farms to glean for free food or to donate food to food banks. Grass-Fed: Refers to livestock, especially cattle or sheep, that have been fed grass instead of corn or soy (grains). Grain is commonly fed because the cattle or sheep fatten more quickly, but grain creates abnormal acidity in their digestive system, which negatively effects their overall health. Meat and milk from 100% grass-fed animals have a healthy ratio of omega 3-6-9′s and a higher amount of conjugated linoleic acids (CLA, a fatty acid that has health-promoting properties). Heirloom: Heirloom crop varieties, also called farmer’s varieties or traditional varieties, have been developed by farmers through generations. Generally speaking, heirlooms are varieties that have been in existence for a minimum of fifty years. Heritage: A term applied to breeds of livestock that were bred over time to be well-adapted to local environmental conditions, withstand disease, and survive in harsh environmental conditions. Heritage breeds generally have slow growth rates and long productive lifespans outdoors, making them well-suited for grazing and pasturing. Local Food System: When all aspects of the production, distribution, storage, consumption, and sale of food are operated, managed, and owned by the community it serves. This is part of the broader sustainable food movement. Locavore: A person who is interested in eating food that is regionally produced as part of the collaborative effort to build more locally based, self-reliant food economies. Natural: USDA guidelines state that all “natural” meat and poultry products can only undergo minimal processing and cannot contain artificial colors, artificial flavors, preservatives, or other artificial ingredients. The claim “natural” is otherwise unregulated. In many cases, it means nothing. No Anitibiotics: Antibiotics are given to animals such as cows, hogs, sheep, and chickens to prevent or manage diseases. “No antibiotics,” implies that a farmer does not administer antibiotics to his/her animals. No Hormones: Hormones are commonly used in the commercial farming of animals such as cattle to speed the growth rate or increase milk production. Some of these hormones are natural, some are synthetic, and some are genetically engineered. If a ranch or product professes “no hormones,” this means that they do not engage in these practices. Hormones are not allowed in raising hogs or poultry. Organically Grown: Food grown without synthetic pesticides, insecticides, herbicides, fungicides, hormones, antibiotics, fertilizers or other synthetic or toxic substances. Organic food does not include foods that have been irradiated or genetically modified. Pastured: There are no regulations as to what this defines. If a farmer states their animals are pastured, the animals should spend time living on pasture as opposed to just having “access” to pasture. Time that an animal can actually live on pasture will vary regionally based on weather and length of growing season. To know for sure, ask the farmer and visit the farm. Raw Foodism: The practice of consuming uncooked, unprocessed, and often organic foods as a large percentage of the diet. Seed Saving: The practice of collecting seeds in order to preserve the genetic diversity of our agricultural heritage that is now threatened by agricultural seed monopolies. Slow Food: An international movement that began in Italy as a reaction to the fast food industry. 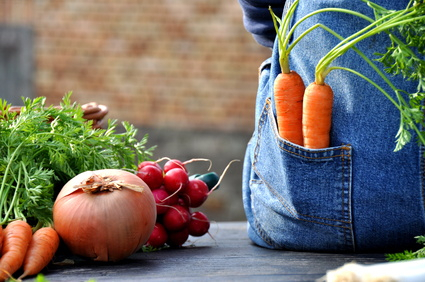 The Slow Food movement seeks to preserve the culture of food by education consumers about the seasonality of foods and which foods grown in their region, by connecting consumers to farmers, and by celebrating high quality food with others. There are Slow Food Chapters all over the world that celebrate good, clean, fair food. Sulphured/Unsulphured: Many dried fruits are sulfured with sulfur dioxide (SO), or meta bisulfate to keep them from oxidizing during and after the drying process. This preserves their original color and acts as a preservative. Unsulfured fruits are often dark in color. Sustainable Agriculture: Farming that is socially just, humane, economically viable, and environmentally sound. Transitional: Farmers must practice organic methods for three years on a given piece of land before the products harvested from that land can be sold or labeled organic. “Transitional” is an unofficial term that refers to farmland that is in a transition period towards organic certification. Urban Agriculture: The practice of cultivating, processing, and distributing food in an urban, rather than rural, environment. Urban farming is integrated into the urban economic and ecological system. For example, large gardens (mini farms) are being grown on rooftops in large cities. Vacant lots are being used for agricultural purposes. Vegan: Foods with this label contain no animal products such as meat, dairy, eggs, gelatin, or honey. 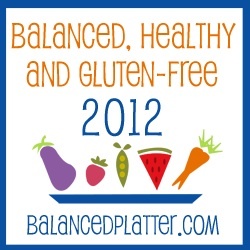 Check out The Balanced Platter for more tips on bringing balance into your life! And please join me on Facebook and Twitter or subscribe to my blog for post updates (see above). Peace, love, and balanced living in 2012! Thank you to Pitchfork Pinups and The Farmer’s Market Coalition for some of these glossary terms. This entry was posted on Monday, January 23rd, 2012 at 6:27 am	and is filed under Celiac & Gluten Intolerance, Miscellaneous, Nutrition Therapy, Seasonal Foods. You can follow any responses to this entry through the RSS 2.0 feed. You can leave a response, or trackback from your own site. An excellent resource, Melissa and particularly helpful to those who have gone gluten-free and find that moving away from the Standard American Diet is the next step for health. I’ve seen that gradual change happen to lots of people who find they need to do more than just avoid gluten. I could not agree with your first staement more! I also firmly believe that the first step to understanding anything is to define the terms or words. What an excellent resource you have here! I will definitely link to this in my next post. It’s so helpful to let people know what terms mean (or don’t). Fantastic compendium here, Melissa–thank you! You have a gift at expressing things very clearly. Not only do I appreciate this one, but many, many others will, too. Oh, and I agree on the goals as well. Thanks for the encouragement to hold them close though. I believe that documenting goals for one’s self is very helpful, but that sharing them does “scatter” them and make them less viable. What a great resource! I had never heard of gleaning before. Thanks for sharing! This is aawesome Melissa! I wasn’t familiar with biodynamic or certified naturally grown. Good to know! I agree with not talking much about what direction I’m going in. It somehow lessens my resolve to get where I want to be. I love this incredible resource you’ve compiled. There tends to be a lot of confusion about what many of these terms actually mean and how they impact our health. You should definitely include this post in a ‘must read’ section that your readers can easily find. Thanks so much for your support of TBP!! This is such a terrific resource! I love that you mentioned multiple times to visit the farm to see where you food is coming from. If we could all see up close how our food is grown/raised, I think it would be easier to make healthy choices. Thank you for this! Thanks for the great resource. I am constantly running across these terms when researching food and it is great to have all the definitions in one place. I didn’t know so many of the terms were unregulated. Melissa this posting is amazing. I found your blog through google. I learned so much with the listing of terminology about (farm talk). You did a great job explaining the definitions. All in one place. There are some new terms here I hadnt heard of before. Great list. Locavore is one of them. Its a great idea though, as is the sustainable movement that I have read about in many restaurants. I’m just parachuting in to see how you are and how your projects are going. I can’t grasp the fact that it’s February tomorrow, what happened to the last two months? It’s always a good reminder to read up on food terminology. In the UK people are often mislead by product advertising, free range etc… that’s one thing but another is how little the average person seems to know about what’s in their food or where it came from. With the rise of cookery tv shows over here you’d think people would be much more savvy about the whole thing but not in my location on the whole. I sometimes notice a glazed look appearing when I talk about recipes and food in general… people only want convenience. Change takes time and in rural towns like mine, perhaps a generation or three. Hope all is well Melissa, we’re missing you on Miles site so pop by when you have time. Here’s to a great year ahead. Thank you for all the info…too! Thanks for all the responses, everyone. I got caught up in work and wasn’t able to take the time to reply. Yikes, so sorry. I read every comment and love all the ideas, contributions, good humor, and friendship. Thank you, thank you, thank you! I appreciate every one of you. SO much! I’ll try to get to these individually soon.